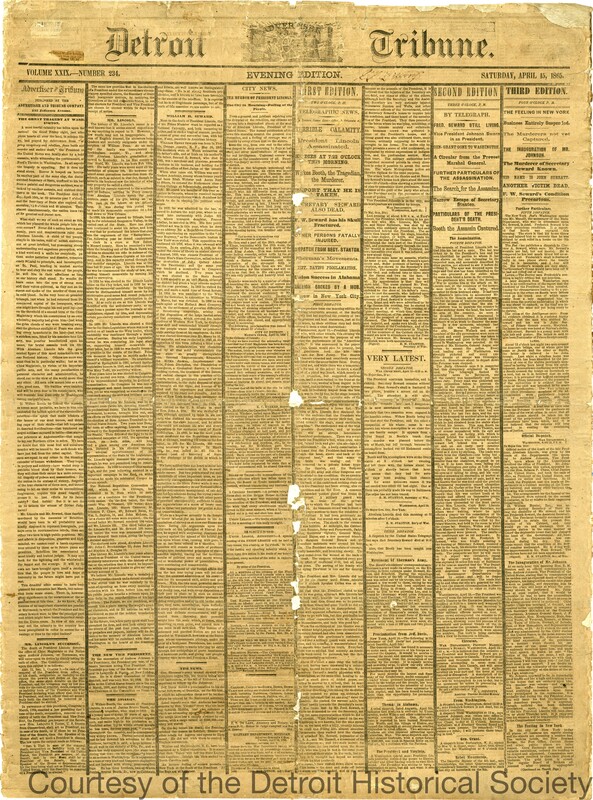 Front page of the Saturday, April 15, 1865 evening edition of the Detroit Tribune mounted to a linen backing. The page is dominated by the news of the assassination of President Abraham Lincoln, and the attempted assassination of Secretary of State William H. Seward, the latter of which it initially falsely reports as succeeding. The paper also includes a message from Detroit mayor Kirkland C. Barker, who requested that businesses be closed, all bells in the city be tolled for the hour between noon and one o'clock, and that the citizens gather for a meeting at City Hall at three o'clock.